Mullinix, Kevin J. and Norris, Robert J. 2018. Pulled-Over Rates, Causal Attributions, and Trust in Police. Political Research Quarterly, p. 106591291879394. Pettit, Becky and Gutierrez, Carmen 2018. Mass Incarceration and Racial Inequality. American Journal of Economics and Sociology, Vol. 77, Issue. 3-4, p. 1153. Weaver, Vesla M. 2018. More security may actually make us feel less secure. Proceedings of the National Academy of Sciences, Vol. 115, Issue. 39, p. 9649. 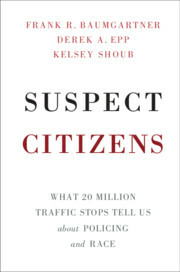 Suspect Citizens offers the most comprehensive look to date at the most common form of police-citizen interactions, the routine traffic stop. Throughout the war on crime, police agencies have used traffic stops to search drivers suspected of carrying contraband. From the beginning, police agencies made it clear that very large numbers of police stops would have to occur before an officer might interdict a significant drug shipment. Unstated in that calculation was that many Americans would be subjected to police investigations so that a small number of high-level offenders might be found. The key element in this strategy, which kept it hidden from widespread public scrutiny, was that middle-class white Americans were largely exempt from its consequences. Tracking these police practices down to the officer level, Suspect Citizens documents the extreme rarity of drug busts and reveals sustained and troubling disparities in how racial groups are treated. 3 - Who Gets Stopped? 4 - What Happens After a Stop?